My Chinese colleague Firedeep has just given me an update on upcoming theatrical release dates. 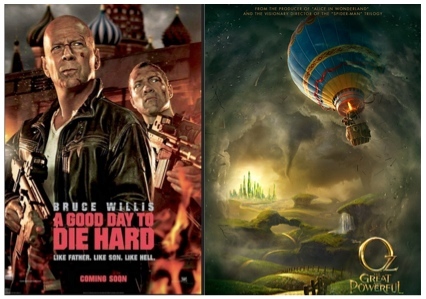 Yes, you read correctly: current word is that Oz and Die Hard will be pitted against each other on the same release date. How and why SARFT makes decisions like this is a mystery to anyone outside SARFT’s inner circles. I should point out that I’m still awaiting confirmation from a second source in China and/or from the MPAA, and It is still possible that one of the films may be moved off this date. Another interesting development was the announcement by Enlight Pictures—the power indie behind smash hit Lost in Thailand—that their upcoming film So Young, an adaptation from the youth fiction novel to be directed by star actress Vicki Zhao, will debut on April 26, the same date that DMG is targeting for Iron Man 3. I’ll furnish more updates as I receive them.